The answer to that is simple. While I was in Yellowstone, I was reminded that the vast majority of time I’m shooting wildlife, I’m not actively clicking the shutter. Instead I’m sitting patiently with my eye to the viewfinder waiting for the moment to happen. With an SLR, that time waiting costs me nothing. My camera is in standby, so it’s not actively running the battery down. Moreover, the sensor is shielded by both the mirror and the shutter and it’s not actively being used; that means it stays cooler thermal noise is kept down. While I won’t deny the benefits of a mirrorless camera, because of the above points I’m not nearly as keen on it as I was in the near past. That said, functionally a DSLR with the mirror locked up and an EVF is doing the same thing a mirrorless camera is doing. The only real question is getting the live view out to the user in a more usable way. Corny nonsense or a clever idea? My first idea is an optional EVF. Canon already has an add-on EVF unit, the EVF-DC2 (and 1 for that matter). 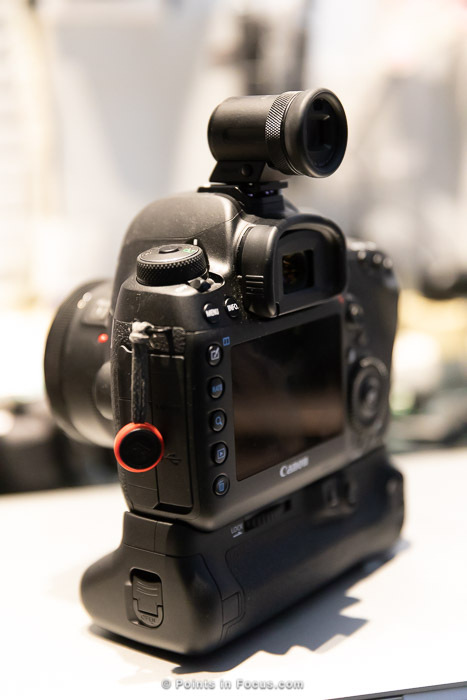 They connect via a secondary connector hidden away in the front of the EOS M6’s (among others) hot shoe. All the hard work has already been done for this. The EVF has been designed, the hot shoe has been designed, the support for it in the firmware and Digic processors has already been done. Put that hot shoe on a 5D body and you have an optional add-on EVF that you can use when you need it and can keep in your pocket otherwise. Alternatively, though it would require much more up front work would be to revive a design strategy that was used in the 70s with replaceable viewfinder modules. Only instead of the modules being for metering, one would be an optical viewfinder and the other would be a electronic one. This would better preserve the overall shape and size of the camera, but would cost significantly more to implement. Moreover, since I’m not envisioning this as the primary way to use the camera — if you want a EVF all the time, you should really get a mirrorless camera — it seems like it would be a more costly and complex solution than it needs to be. Finally, going along with the idea of expanding the display capabilities of the camera is moving to an articulated LCD. Canon has already done this with the 6D and lower tier cameras, and Nikon as brought the articulated display to the D850 which is functionally similar tier. At this point, there should be plenty of information regarding the reliability and ruggedness of an articulated display. Nikon was certainly confident enough that the D850 wouldn’t be a disaster with one, and I see no reason Canon couldn’t the same if not better in that regard. When it comes to flash media, there’s a lot of factors, considerations, and even some personal preference. What’s going to be the case the vast majority of the time is that every photographer is probably going to have a slightly different situation. The thing is, we’re now at an interesting juncture where technology is starting to really consolidate. The two next generation standard flash media formats are SD Express and CF Express, both of which use the PCI-express (PCIe) bus and the Volatile Memory Express (NVMe) protocol. PCIe, however, is just a general purpose interconnect. It’s the thing that ties all the components together in your computer (e.g., lets your CPU talk to your GPU). And being a general purpose interconnect, there’s really no constraint as to what kind of device could be put on the other end. Broadly what this means is that if you have a camera with a processor that can talk PCIe to a SDexpress or CFexpress card, it should also be able to talk to a PCIe to SD or PCIe to CF bridge chip. In other words, it wouldn’t be especially difficult to have interchangeable card slots since the back end would all be the same interface, PCIe. Why bother? The answer is flexibility and costs; not Canon’s costs, but my costs as a photographer. I have a rather substantial pile of flash media, most of which are Compact Flash cards which are clearly obsolete, and almost certainly won’t be supported in the next generation cameras. However, at current prices to replace them with more modern cards, either UHS-II SD, CFast 2, XQD, or CFexpress, I’d be looking at a minimum outlay of $1000 on flash cards if I went SD, and more if I went for the other formats. That’s a tough pill to swallow all at once, especially immediately on the heals of a hypothetical $3500 camera purchase. Compounding the situation, my current cards wouldn’t be worth much in terms of resale. And that assumes I could even sell them; if I didn’t replace all my cameras, I would still need my cards for my old camera. And there’s really a outstanding question as to whether or not I really need faster cards in the first place. Admittedly, if cards are fast, the camera can exploit that to have less buffer memory. If a 5D mark IV could sustain 500 MB/s writes to a flash card, it could in theory shoot at 10 FPS indefinitely at almost any ISO setting. But high framerates aren’t something everyone needs. 7 FPS and 3 seconds of shooting, what I get out of my current 5D mark IV, is more than adequate for landscape photography, and I’m not even complaining about it for wildlife. Moreover, the 100-150 MB/s write speeds are sufficient to cope with 500 Mbps video — which would be even less relevant if the camera records in H.264/AVC or h.265HEVC, which gets much better quality at lower bit rates. Don’t get me wrong, I’m not saying I want to sit on CF cards forever either. But with changeable flash card slots, I wouldn’t have to either. I could configure the camera with one CF and one SDexpress or CFexpress cards now, and in a year or two, when I’ve bought more fast cards, switch it entirely to the more modern standards. I really applauded Canon when they released the original 7D where you could customize many of the controls. Canon continued to build on that idea with subsequent cameras. However, while they’ve added a few more buttons that can be set here and there, and some new things those buttons can be set to. The overall level of customization available is a paltry subset of the capabilities of the camera. For example, next to my shutter release there’s an Multi-Function (M-Fn.) button, on my 5D4, I can set it to AE Lock, RAW/JPEG Switch, Start Movie Recording, and disable. That’s not a lot of options. And to be honest, many of the options are things I couldn’t care less about — though certainly others might. But why can’t I set the M-Fn. button to lock the mirror up? Or enable or disable a pre-set exposure bracketing sequence? Or toggle the state of DualPixel RAW? Or any number of other options, that I have to dig through menus to get to but only offer a on/off toggle setting. For that matter, why are certain buttons limited to certain actions? Depth of field preview can only be assigned to the font “depth of field preview” button (though on cameras like the 1DX, either both of the front two buttons can choose from the same options). I understand why that makes sense when shooting with the viewfinder in a normal way, but when shooting in live view it can be kind of awkward, especially when the camera is at a high or low angle. Honestly, there’s a lot more I could add to a 5D mark V wish list. I’m not opposed to more resolution, a higher frame rate, or improved video capabilities; things that commonly comes up in these discussions. But at the same time I don’t think that’s all that interesting to talk about either. It’s certainly not an “out of left field” kind of idea that might not have been considered. Though I admit I don’t really consider anything I’ve suggested to be really out of left field. And truth be told, while my list of things I’d like to see improved or added is much longer than what I’ve covered in this post, it’s not like i feel that the 5D mark IV is a bad camera. In fact, I think quite the opposite. The 5D mark IV is the best camera I’ve owned to date, that doesn’t mean there isn’t room to improve it.